Judging by the colour of their clothes I had a good idea what the road ahead was like. And they were in a vehicle. The tohelandback duo, two young English guys I’d briefly met in Yaounde, who are driving around Africa in a sponsor-emblazoned Land Rover, met us for lunch and kindly donated their dust masks before wishing us well for the road out of Bertoua. 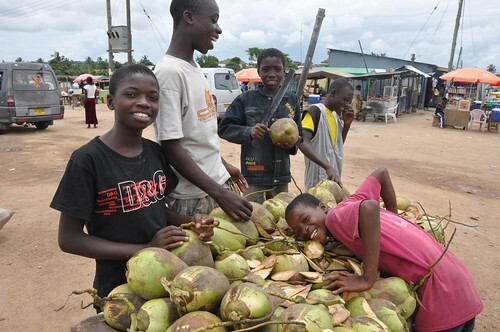 The best thing about the journey from Cape Coast to Accra is the fruit being sold at the roadside. Lines of stalls overflowing with pineapples and watermelons, and carts filled with fresh coconuts. Forget the glutinous starchy fufu and oily soups, I reckon I could survive on fresh fruit alone in Ghana, and many other African countries for that matter. Bicycling is the nearest approximation I know to the flight of birds. The airplane simply carries a man on its back like an obedient Pegasus; it gives him no wings of his own.